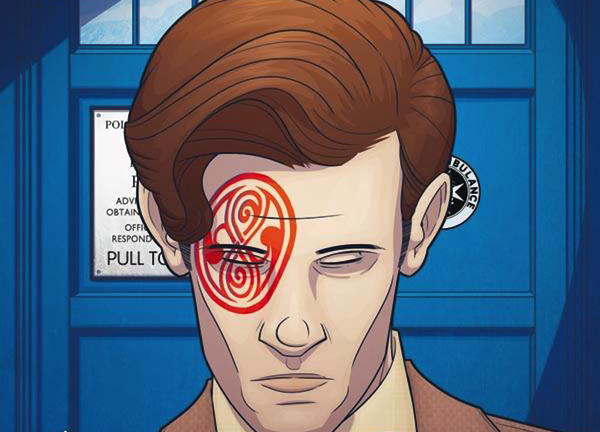 Doctor Who: THE ELEVENTH DOCTOR #2.11 Review @comicstitan | Warped Factor - Words in the Key of Geek. In the course of the last year of the Eleventh Doctor comics, we’ve seen the return of Abslom Daak, the arrival in comic-books of River Song, an artefact from the 80s, a prison from the 70s, Sontarans with silly goatees killing each other for facial hair preference, and a creature so demented it destroyed its own timeline. Forget all that. This is the issue in which things to totally tonto. It’s actually something of a misnomer to call this an Eleventh Doctor comic-book, because he of the unfortunate headwear and ‘really, no it isn’t cool’ bow-tie only appears here in flashback sequences. We’re not in the here and now of the Eleventh Doctor’s timeline any more, we’re very much in the there and then. The there and then being – take a breath – the Time War. Alice Obiefune, the London librarian, has done the unthinkable and smashed her way into the Time War. It’s hard to tell you who she meets there and what happens to her without spoiling you completely, but let’s just say writer Si Spurrier might do worse than sending this issue in to Big Finish in case there are any future writing gigs going. It’s rich with appalling, diabolical invention, and includes the fabled six impossible things before breakfast – unlikely allies, unthinkable options, poetical, spoiled-brat sadistic villains, and the answer to at least one question from the previous ten issues. The answer is yes. Enjoy working out the question to which it’s the answer. There are daring rescues here, though what they’re daring rescues from is harder to say. There’s torture here in a form which feels distinctly quease-making, and there are things which should be familiar. That they’re so utterly alien to us is a result of a cracking combination of Spurrier’s invention running overtime and artwork from Simon Fraser which looks like something from the wrong side of the Toy Story fence – like someone knew what was familiar to us, then went crazy reimagining it like a kid with a toolbox of broken toys. It’s creepy stuff, and it delivers a lurch in the pit of our stomach when we know that Alice is at the mercy of these things. The stretch to move the actual story on feels like a long one, as we begin to answer the question of who the Overcaste might be (for the memory-challenged, the Overcaste were the people who originally put the Eleventh Doctor on trial for destroying their ‘gods’ in the Time War and set all this toing and froing in motion, although it’s worth noting they’ve gained the final ‘e’ since we last met them!) and who and what for that matter, their gods the Cyclors are too. Discovering all this has a solidly New Who feel – the daring to invent realities that interloop, and which we only vaguely pondered about before now because they were so far-fetched as to blow our minds. That said, that’s quite a large part of the point of the Time War – it’s a space and time defined by being practically unthinkable, so any writer who dares to tread on its blasted turf had better be up to the challenge. Spurrier proves his mettle in this issue, daring to work things out that we’d never even dreamed of, and more to the point, giving the period a character, a tone that actually feels more distinctive than anything Big Finish has yet come up with about the Time War. The exhaustion, the impossibility, the absolute insanity of the time is well rendered here, both in terms of the dialogue Spurrier provides, the artwork Fraser adds to give it a sense of the utterly alien, and even in terms of the lettering from Gary Caldwell, which gives the ostensible villains here very different individual voices, from the slavering to the sing-song to the bored child with their hands on a destructor-ray. This might only in a tangential way be an Eleventh Doctor comic-book, Alice providing an umbilical to the main thrust of the story, but there are some glorious callbacks to earlier issues of this run – in fact, the very first panel of issue #2.1 is recalled and re-used, giving us a sense of coming distinctly full circle. There’s more than that recall to inspire the sensation of coming to an end though – while we have yet to definitively find out what causes the creation of the Malignant, the curse that blights the Overcaste for generations, we do feel very close to getting an answer to the question of whether the Doctor did the things he was accused of doing. There’s a box of diabolical tricks in this issue that we’re watching as one watches a ticking backpack, and we get the sense that there’s what amounts in plotting terms to a big red threatening button that someone, sooner or later, is going to press. The question of who would do such a thing is left to tease us forward, and as we uncover more about the Overcaste and the Cyclors, we’re left to wonder whether the big red button option might be altogether the bad thing it’s been painted to be. Should you buy this comic-book? 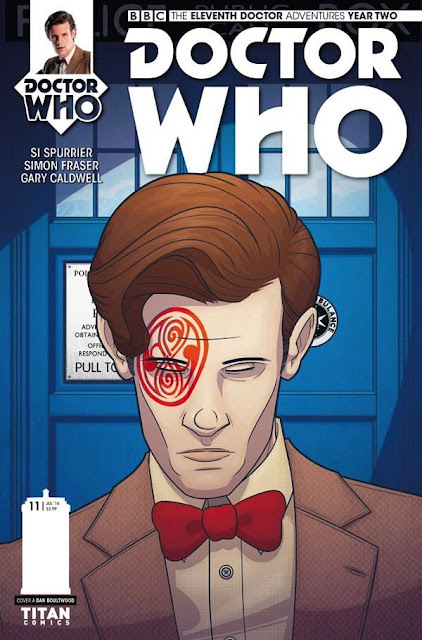 Well, on the basis that you’re a fan of the Eleventh Doctor in comic-books, of course you should – there are answers to some questions about his latest adventure that have been bugging us for almost a year in this issue, as well as more questions to make us wonder what the heck is really going on. But there are plenty of thrills in the issue irrespective of the Eleventh Doctor’s brief and flashback appearances. The surprise alliance (and more particularly the revelation of exactly who’s in it) is a shock that makes us read on, but the villains steal the show – you’re absolutely not going to want to miss them in their own right, let alone the progress they help us make in the overarching storyline. Get #2.11 today, and set your brain to its ‘boggle’ position.